I love Ebates and have received a small rebate check ($3.70) in January based on my online purchases. I've also received a $10 Target gift card as a sign up bonus (promotion at the time). Looking at my account, I see that I'll be receiving another small check ($5.70) in the next couple of weeks. Again, based on percentages of my online purchases. Having said that, my favorite experience with Ebates, involves my mom. The scenario that I am about to share is from a purchase she made just a few weeks ago. Earlier last month, my mom asked for suggestions for a birthday gift for Grace. My mom knows that we spend a lot of time outdoors during the summer and wanted to get Grace something for the yard. I suggested a picnic table. Mom did a lot of research before choosing the picnic table that she bought for Grace. She read reviews, checked measurements, etc. 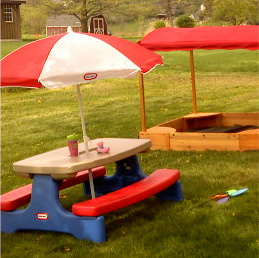 Mom wanted the table to be sturdy enough to handle the clumsiness of a toddler, she wanted the size to be something that Grace could use for a couple of years, she also wanted the table to have an umbrella. She found the perfect table on the website of a well-known toy store that was advertising FREE SHIPPING for purchases over $100. The table was $79.99, so we chose items (for Grace) to add to her purchase to bring the total up to the FREE SHIPPING requirement (preferring to buy products rather than pay shipping), only to read the small print that stated that only the first $20 worth of shipping was free. (Shipping for the table alone was $26) Annoyed, I helped my mom find a better deal on the same table. I had already told my mom about ebates. She signed up using the referral code that I sent her, but hadn't made a purchase yet. I found the exact table on sale at JCPenney.com for $69.99. Not only was it $10 cheaper than the well-known toy store, the shipping was 100% FREE!!! And, to sweeten the deal even more, JCPenney is an Ebates participant and were offering 6% cash back on purchases made through Ebates! In the end, Mom bought the table for $69.99. She'll receive 6% back for shopping through Ebates ($4.20) and also will receive $5 for signing up. Making the table only $60.79 (she almost paid over $100 including shipping on that other site that wasn't an Ebates participant!) after she receives her ebates check and sign up reward!!! Plus, since she signed up and made a purchase based on my referral, I will get a $5 check in the mail! And of course, Grace just LOVES her picnic table! The photo above, was taken just a minute or so after I put it together and she already had her sippy cup and toys on the table! The 6% cash back is based on a Mother's Day promotion that offers Double Cash Back for a limited time. At the time of this post, that percentage was still in affect. Not all online shopping sites are participants of the Ebates program and participating stores cash back percentages vary from site to site. If you sign up using my referral link, I will earn $5 only after you make an eligible purchase. Nicely done!! You totally saved her a whole tank of gas!! I stumbled (and reviewed)this! And I just stumbled your post! Gotta love when you can find a sweet deal like that!!! I do love Ebates! Thanks for sharing your deal and for stumbling by the other day! Great deal, and surely nicely done! I stumbled your post, could you stumble mine please?